Cardboard boxes, bags, barrels, wooden boards and a variety of other applications – the vacuum tube lifter Jumbo tackles big jobs in the shortest amount of time. The intuitive operation allows you to move loads quickly, precisely and always ergonomically. It is the ideal aid for machine loading, for shipping and picking areas and for many other lifting applications. 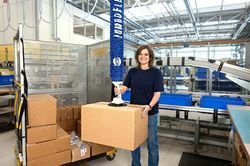 The vacuum tube lifter JumboFlex allows you to move lighter goods up to 50 kg ergonomically and with high cycle rates. The control handle fits comfortably in the hand and allows the operator to work for a long period of time without fatigue. With simple one-finger control, lifting, lowering and releasing the load is extremely intuitive. The JumboFlex's wide range of features allows it to tackle virtually any task. It comes standard with a quick-change system for replacing the suction pads. Workpieces which are gripped from the vertical side automatically swing back into the horizontal position where they can be continuously rotated. This lifter is mainly for workpieces with many different shapes and sizes.The twist grip on the Jumbo Ergo is designed to operate like a motorcycle throttle. Large and heavy loads such as wooden boards, cardboard boxes and solar panels can be moved gently and precisely. The length of the operator handle can be varied, which allows the user to always maintain a safe distance from the load. This tube lifter is especially for compact workpieces. The JumboSprint is equipped with a bow-shaped operator handle which extends all the way around the unit. 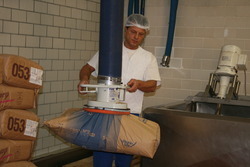 This allows the user to optimally position it on compact goods such as bags or rubber bails. The load is raised by pulling up on the handle lever and lowered by pushing down. Looking for Vacuum Tube Lifter Jumbo ?